Visual AVCHD Time Stamp (vATS) allows you to extract and superimpose date/time codes from AVCHD captures onto the video itself. Visual AVCHD Time Stamp works only in Windows 7. Supports NTSC or PAL AVCHD file formats. Supports large file size (> 100GB). 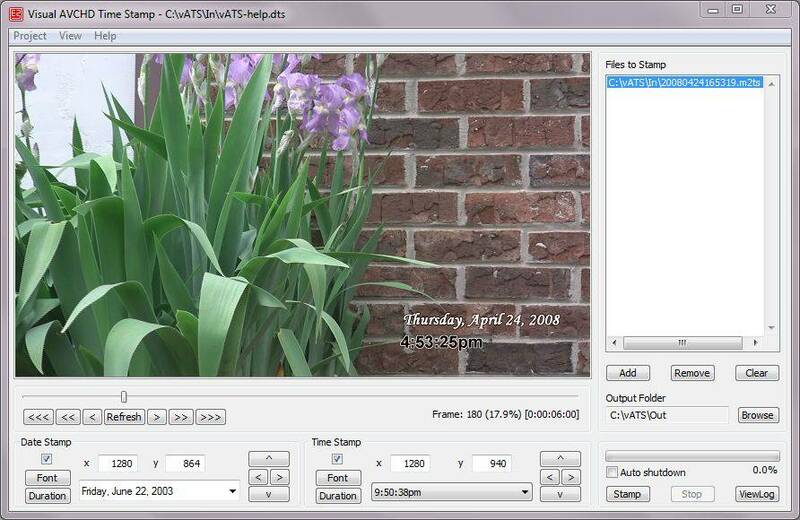 Superimposes different formats of date/time to the video, including custom stamp format. Time adjustment (years, months, days, hours, minutes, seconds) to the recording time code. Stamp in different languages (Numeric, English, Chinese, Czech, Danish, Dutch, Finnish, French, German, Greek, Italian, Japanese, Korean, Norwegian, Polish, Portuguese, Romanian, Russian, Spanish, Swedish). User selected font (face, style, size). Font brightness adjustment, optional font outline, and transparency adjustment. Preview stamped video, accurate to pixel level. The effect of any change to the stamp options can be viewed instantly, before actual stamp process starts. Shutdown computer automatically up on completion of stamping all files. Save settings in a project file. New feature: support HW decode if new version NVIDIA GPU is available. Also, if such HW decode is used, HW encode of non-native size is also supported.